A while back one of my readers who has a severe nut allergy asked whether I knew of a completely peanut- and tree nut-free brand of tahini. Gosh! I had no idea that tahini was often contaminated with nuts so I checked my jar (I believe this particular jar was Once Again) and sure enough the label said, “CONTAINS SESAME SEEDS.” Duh! But the finer print underneath that said “Manufactured in a facility that also processes peanuts and soy, and on equipment that processes other tree nuts and seeds.” Interesting. And a bummer for those with very sensitive nut allergies because I would have thought that seed butters are the perfect replacement for nut butters in those cases, but apparently that’s not so. To add salt to the allergy suffers’ wounds, tahini adds a certain richness to hummus that you just can’t achieve when it’s omitted or even swapped out for olive oil. 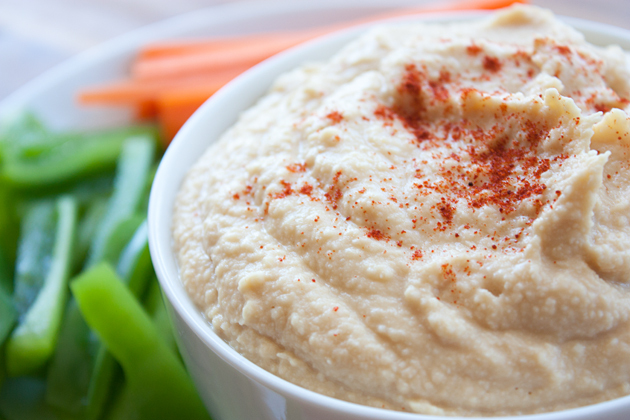 It’s not just the fat content in tahini, but also that thick paste-like consistency that gives hummus a deliciously smooth and rich consistency. So my solution to all of the dear nut allergy sufferers of the world who want to have their hummus and eat it too, is to toast your own sesame seeds and essentially make your own tahini by adding them to a blender (note: not your food processor) along with your other hummus ingredients. Glorious sesame paste without the allergy can be achieved! First you need to toast your sesame seeds in a medium skillet over medium heat. Shake the pan and stir the seeds with a wooden spoon so that all of them are evenly roasted. Once they’ve browned and become fragrant immediately remove them from the heat and empty into a heat-proof bowl or plate. Then take all of your hummus ingredients and empty them into your blender and whirl away. 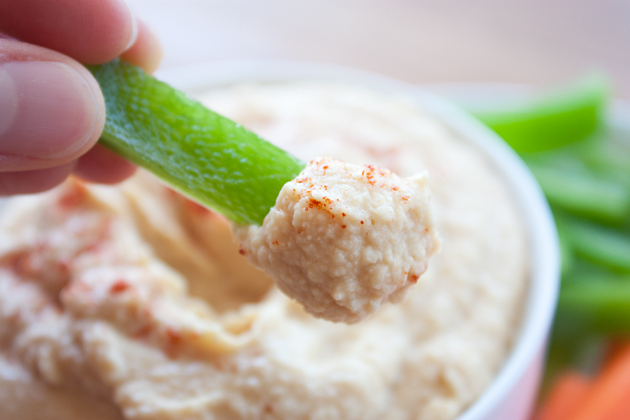 Add small amounts of water at a time until you achieve that perfect hummus consistency. Finally, add salt at the very last step. 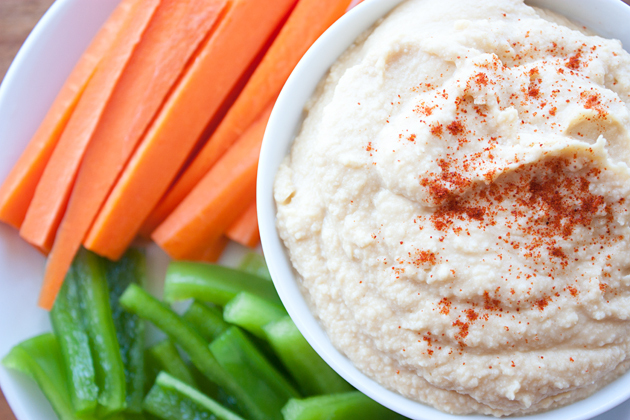 In comparison to regular ‘ol tahini hummus, this version has a much stronger sesame seed flavor. 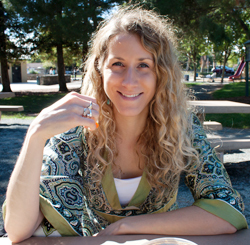 In fact, I was pretty floored by how much more flavor it added and it was a flavor that I absolutely loved. However, if it’s too strong for you or if you don’t like that roasted flavor you could add the sesame seeds raw, too. Even though I haven’t personally tested this, it should work in theory. Toast Sesame Seeds: Pour your 1/4 cup of sesame seeds into a medium skillet over medium heat and cook for about 3-5 minutes. You’ll want to shake and stir the pan very frequently whiling cooking so that they are evenly roasted. They’ll become fragrant and slightly brown when done. Immediately empty the sesame seeds into a heat-proof bowl or onto a plate to stop the cooking. 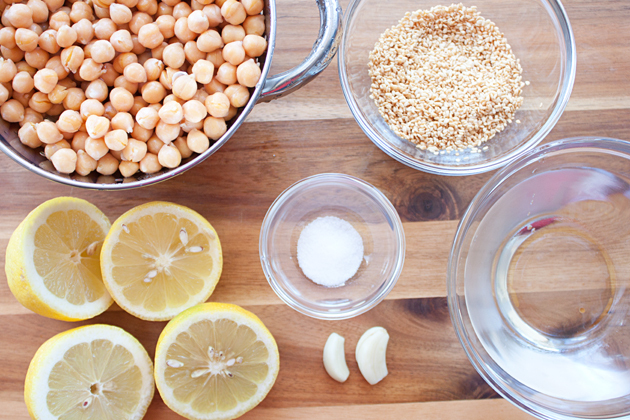 Blend it All Together: Add the chickpeas, lemon juice, garlic, sesame seeds, and 1/4 cup of water to your blender. Continue to add water in small amounts to the blender until it reaches the consistency you desire. Then add salt. Again, start in small increments and keep adding until you’ve achieved the perfect-to-your-tastes saltiness. Serve with fresh cut veggies, pita, or on a sandwich or wrap. Also, if you’re serving this to a crowd you may want to add a dusting of paprika for garnish.